Zoya Akhtar’s Gully Boy is probably one of those rare Bollywood offering that has had both the masses and classes cheering and rooting for it. While we can leave out the masses and the film's box office performance for the moment, does the film really add much more to scratch as it is being made out by some critics? Encomiums for the film has emerged even from more left leaning news media sites i.e. The Scroll, The Wire and Huffington Post who all had very positive reviews. I was finally nudged to view the film when the more academic EPW too carried a piece, effusive of the film's supposed less than formulaic rendering of subaltern dreams. The plot and premise of the film, I avoid going into here which one safely assumes is well known by now. When I came out of the packed multiplex, I was quite overcome with a sense of ambiguity and confusion. While the crowd probably was not dished a Salman Khan trash or Karan Johar’s shameless celebration of affluence, but then I wondered where was the novelty in stories of the disenfranchised making it big? Have not several flicks of Bollywood beaten to death such a themes? But yet Gully Boy is seen to be unique. On of its perceived sui generis singularity that the movie focuses on is the the social demography of Muslims in Mumbai’s slums. The claustrophobic and dingy spaces of their life and living permeated with crime and violence is seen to be authentic. But further via Muraad, the film's lead and eponymous Gully Boy ( actor Ranveer Singh) this demography is now trending towards confronting their marginalization with certain agency and negotiation. Education, white collar and service jobs are opening up possibilities for them where its leading protagonist while conscious of his ‘Muslimness’ and often reminded of it, nevertheless seeks to mediate the few opportunities that comes to him, to his advantage in ways that are reflective. Further he also refrains from playing a victim. Poor, marginalised Muslims are not automatically susceptible to jihadi mindset as the stereotypes would have it. Importantly in the film, for Muraad in particular, western modernity in the form of rap music, is seen as liberating in ways where irrespective of class, status and identity, it is a leveller, in which talent and merit can flower and excel. And of course, technically the film’s music, photography and art direction have been noted as first rate. While these positives probably cannot be taken away, but the issues the film highlights could and should have been dilated upon better, in which its casting and use of film craft needed further infusion of originality and being less risk averse. I basically do two things here: voice not just issues with the film but also raise issues with those whose applause are possibly mistaken as well. It is probable that I'm overlooking something in the film and also have misunderstood the paeans that this film has invited. Nevertheless I will stick my neck out and state few things which in my view makes the film problematic if not formulaic. Some may find my iterative refrain in this piece overly negative but then the positive narratives of the film have engineered a buzz and hoopla which does not stand critical scrutiny that an otherwise acclaimed film should, as we shall see. Firstly, Muraad’s talents. It appears only ‘talents and merits’ can redeem and provide salvation to the marginalized. In focusing again on an exceptional talent in Muraad, it is then made that the ‘meritless and talentless’ do not have possibilities of escape from marginalization and deprivation beyond the ordinariness of a driver's job or a clerical job. Worse the alternative further could only be lumpenism and crime. In such a sense Muraad’s father, his anxiety and doubts are something that appear genuine and probably not villainous when he is alarmed at his son's gamble with his talent in the new domain of rap. Second, to make it big in rap, these opportunities are available to Muraad only beyond the confines of both his socializing space and socioeconomic demography. Even M C Sher, who spots his ‘talent’ and drive, is a non-Muslim, located higher than Muraad in the pecking order not to speak about the brazen and vulgar affluence of Sky- Kalki Koechlin. It are these two whose patronage, eventually helps Muraad to make it big. And let's not forget the communication and networking giants with their financial clout and heft - Youtube and Facebook- but yet seen today as equalising and democratizing the public sphere emerging in virtual space. Muraad’s competence as a rapper is noted through social media and its seeming selflessness, openness, its agnosticism viz identities - social or economic that the disenfranchised and struggling like Muraad manage such a splash and their agency rendered. However we are aware of the structural inequalities that current reign of global capital exacerbates. Indeed notwithstanding its supposed democratizing claim, the world wide web and those riding high on the cyber highways business opportunities, does it reinforce status quo or worse widens the existing iniquitous social relations? Gully Boy to me was being unexceptionable in true Bollywood tradition on very conveniently focusing on the exceptional, for a more neat and edifying narrative. This undergirding context of structural unevenness is ‘normalised’ in the film, as indeed most Bollywood cinema does. Also when several opportunities emerge for Muraad to state and act in ways where such contradictions are on his face, he steps back no more than observing a thing or two in very anodyne fashion. The scene where Sky confides her amorous interest in Muraad, he does ask her what she sees in him and then when you think he is going to highlight the obvious and chasmic class difference, he merely says he loves Safina (his sweetheart from childhood) more. And importantly what if Muraad was not good enough to make the final cut and was eliminated like M C Sher in the preliminaries? Indeed I was curious and wondered what happens to M C Sher post Muraad making it big. The goody-goodness and non ego-centric character of M C Sher was too archetypical in a film which is supposed to be more grounded and ‘real’. In contrast and relative comparison, in the recent Tamil film Sarvam Thaala Mayam, the ego and envy of an upper caste musician constantly seeking to subvert and sabotage attempts for respect and vindication of an aspiring Dalit, rings far truer. So it appears that merit, talent and success alone paves the way for even mere survival with some grace. Those who lack it are doomed either to mere clerical chores at best or crime at worse. We invite alienation, angst and marginalization if we fail. Ranveer struggles to clear his degree, resorts to crime but his talent in rap redeems him. While his resoluteness is admirable but is it that you cannot be ordinary, lacking distinction and yet be resolute, honest and with integrity? Indeed is being ordinary in absence of some inherent genius or merit - in academia, art or sports the biggest failure, indeed a sin? I wonder when such burden being carried by so many millions particularly the economically impoverished, will be raised for questioning and probing in popular imaginations. I actually thought somewhere in the film, this aspect was just on the cusp of being raised. But regrettably it never does and we get no more than a whiff and very obliquely so. None of those who have otherwise interrogated the film, mostly so positively, have also queried this aspect. Thirdly, the representatives of the same classes located much higher in the hierarchy - M C Sher ( he even has a white caucasian girlfriend), Sky and Muraad’s love too, the aspiring doctor Safina or even his maternal uncle in an affluent managerial job are no where around when Muraad needs them the most i.e needs money to start a new establishment with his mother, post walking out of the house unable to deal with his father's abuses. Here Muraad’s class catches up with him and it is his criminal friend who helps him out by carjacking in which Muraad himself, otherwise shown to be reflective and idealistic, more than willingly becomes an accomplice. Maybe to the extent that he refuses to deal with drugs and implicate children indicates his more redemptive qualities. Thus the ‘text’ itself serves its own contradictions, very unaware of this slippage where the focus is more on the meta-narrative of burnishing the life of an exceptional talent who makes it big, seemingly through his hard work, passion and against debilitating poverty. And loads of assistance from the not so rich and the nauseating rich. Fourthly, and in context of all the arguments made above, it may be contended that it is only in the domain of music, that Muraad contests the arrogance of the elite. Several other rappers, coming from more affluence insinuate, mock and insult Muraad’s background to which the latter in very layered and hard-hitting verse defends himself and the socio-economic segment he represents. Yet Gully Boy decontextualizes a form of music like rap so organic to working classes particularly for black identity and their politics in US. In the film the fact that a sizeable majority of rappers are from more endowed classes suggests otherwise. While the film is putatively based on real life rappers Divine and Naezy from Mumbai, rap in India is no Gana (Chennai’s urban Dalit music) but something that has been an import through western dominated media and mass culture. Its rhythm is seductive and catchy. It seems that when folks of affluence adopt this idiom, aspects of class, history and culture otherwise so germane to rap are flattened. It's more the form than substance and since in art, both form and content are as such indiscrete, even the subaltern adoption becomes messy unless a more radical political consciousness, informs not just their music, art, performance but even their daily lives and their routine practices. Nevertheless such imported music form claims genuine link with subaltern angst. But dangers of appropriation where the marginal themselves collaborate are real. This film evidences to this argument. Muraad the Gully Boy is, as I have argued so far is complicit in his own appropriation. The recent interest in rap across India by many Dalit groups, including in Chennai, again cheered by media (check op-ed The Hindu, dated March 16, 2019) needs careful examination by its adherents. Fifthly, there is another feature (pun intended) in the film not so untypical in such oeuvre, what I call the problem of film time. Everything and all happen around 150 minutes - Muraad’s (re)discovery of rap, his sudden rise to significance and fame, his walking out of the house etc. In actual terms as somewhere in the film it is indicated, everything is happening within an year and less. Though his love for Safina predates the film time (been in love from school days as Safina asserts) but everything else is so neatly packed to serve a teleological narrative all hurtling towards a denouement, which again is unseeming and undermining the supposed realism that the film is supposed to reflect. 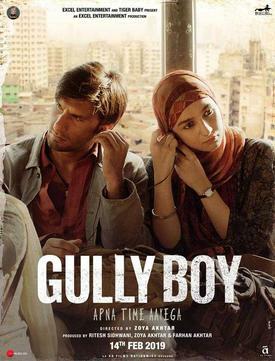 In itself most of cinema suffers from this but then what is so exceptional about Gully Boy in terms of film form where such telescoping and compression of time makes matters it depicts so sorted? For a truly counter narrative, I would reckon a better understanding of subaltern culture and politics is needed beyond one of mere posturing or victimhood. This is certainly difficult - all art forms attempting genuine engagement with representations usually are. This is more so for those so steeped in Bollywood cultural aesthetics and bound by entertainment considerations. Finally, the very casting of Ranveer Singh as Gully Boy was ill conceived in one's honest view. The glamour and glitz of Bollywood stars, their grossness, vulgarity and unashamed on the face ‘apolticalness’ is so offensive. Yet such stars are cast in roles where they posture and mouth matters of the politically conscious and that of a subvert (supposedly), which jars no end. I found it difficult to separate Ranveer Singh the brazen, unapologetically flamboyant star that he is, from the dramatically opposite role he was playing in this film. The argument of separating the personal and professional hardly cuts any ice and becomes far too contradictory in films which posture criticality. While here one cannot go through matters in much detail, the discourse and dominant practices which exemplifies professionalism today, have several flaws that weakens civil society and public sphere. Of course it are not just Bollywood stars - if we can even call them professionals - but even doctors, lawyers, journalists, teachers etc whose very instrumentally dominant notions of professions so undermines political transformation today of selves and emergence of the citizen. Possibly a less glamorous actor. Indeed a non actor (not even current alternative cinema staple of a Nawazuddin Siddiqui or a Raj Kumar Rao) alone would have made so much of difference to the film. I wonder if all those today showering hosannas to Gully Boy have seen a Saleem Langde pe mat ro, a Chakra or a Dharavi for a more gritty look at those marginalized for reasons of both class and culture. And I also wonder if bland political correctness compels critics to laud a film which simply because centres on disempowered communities, Muslim, Dalit, tribal or LGBT, in itself is sufficient for applause and approbation, ignoring complexities of representations, film form and aesthetics. Critics I find have ignored the clever and leading ruses this film adopts and let their guard down to applaud a promising but yet a film that barely fulfills its possibilities in terms of form, style, techniques not to speak about exploring its avowed theme in certain complexity. While the film does avoid certain cliched tropes but its novelty wears thin and hopes to ride on supposed political correctness of its thematic intent alone. Merely on that count critics have hurriedly looked for more merits which are either actually absent, weak, simple, incomplete or mistaken.